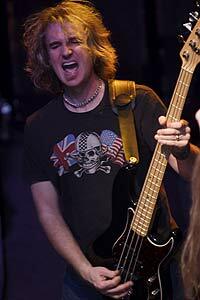 I recently had a phone-chat with former Megadeth bassist and old friend David Ellefson. In this candid phone interview David talks about his new bands F5 and Temple of Brutality as well as digging deep into Megadeth's past. Ellefson is a busy man these days, he's currently out on the road with F5 supporting their debut release A Drug For All Seasons, in between the F5 shows David is filling in on bass for the legendary classic metal band Montrose [which also features former Megadeth drummer Jimmy DeGrasso]. David is in good spirits and despite all those nasty rumors Ellefson had nothing but great things to say open his former Megadeth bandmates. SW: First off, let's talk about your new band F5...you're currently on tour? DE: We're out doing shows at the moment; the video for the song "Dissidence" just got added to MTV2 Headbanger's Ball. We just want to be out playing in front of people. We did some stuff just before Christmas supporting George Lynch and we have the Jagermeister Music Tour with Staind and 3 Days Grace coming up. F5 is hard and heavy, yet it's also very melodic so it opens a lot of possibilities for us. DE: I figured with a new band and new players it's been creatively liberating for me. When you do have a clean slate and a blank canvas you begin to draw a whole new picture that is kind of a cool thing because there are no boundaries. Once you've made your first album you've pretty much put yourself in a box since that is what people will automatically associate you with so it was kind of cool to do a debut album again with a whole new band. SW: How did you hook up with the members of F5, were they musicians you've known over the years or did you recruit them through auditions? DE: To be honest with you, in 2002 I had no plans of putting a new band together. I didn't really know what I wanted to do...I wrote a handful of songs, co-wrote some songs with other people and that's when I really started looking for new groups to do developmental deals with. So that's how I met Steve (Conley - guitars) and Dave (Small - drums), they were in a band called Lifted from Phoenix. The singer Dale (Steele) I met in Minneapolis when I produced some tracks from a band that he was in called Numb. Dale was also in a group called Six-Feet which my understanding was the incarnation of Stuck Mojo and Fozzy. Our other guitarist, John Davis, was brought in through Steve after John got an audition for Halford (after Pat Lachman left the group). SW: How did producer Ryan Greene come into the picture? DE: I knew Ryan in LA back when we did the Countdown To Extinction demos over at EMI/Music publishing studios in late '91 right after the Clash Of The Titans tour. Ryan was the house engineer at the studio. And I hadn't seen him in years, and then one day I ran into him at Steve Smith's [executive producer for the F5 record] home studio - it's a phenomenal studio, it's like the Record Plant in his home in Scottsdale, AZ. And I walk in the studio and see Ryan working on the new Authority Zero record. I told him about F5 and a couple months later, in early 2004, we started doing the record.